In case you are being bothered by unwanted calls, you can easily prevent such callers from bothering you by blocking their Phone number on your iPhone. 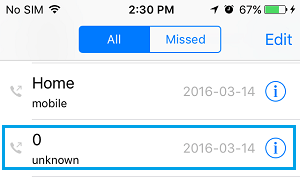 In this article we will show you how to block both known and unknown callers on your iPhone. Your iPhone comes with a call blocking feature that can be used to block both known and unknown callers on your iPhone. 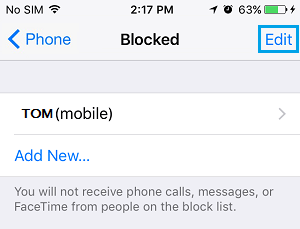 When you block a phone number on iPhone, the blocked callers will still be able to call you and send you text messages. However, they won’t get a notification that the call or message was blocked. Similarly, your iPhone will not bother you by sending notifications about a blocked caller trying to contact you via phone calls or text messages. In case you come across an unknown phone number that is spamming you, wait for the call to be silenced or disconnect the call. 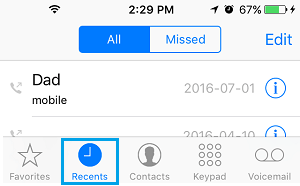 After this you can look for the number on Recent Calls tab and block phone calls from this annoying caller on your iPhone. 1. From the Home Screen of your iPhone, tap on the Phone app. 3. 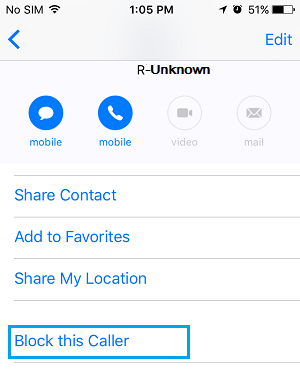 Next, find the Caller that you wanted to block and tap on the “i” icon next to the Phone Number (See image below). 4. On the Callers info Screen, scroll all the way down and tap on Block this Caller. 5. You will see a popup asking your confirmation, tap on Block Contact. 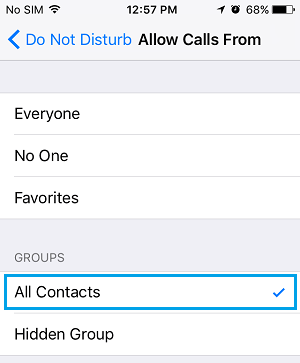 The basic call blocking feature on an iPhone can be easily bypassed by those callers who hide their Caller ID or use other ways to block their phone number. 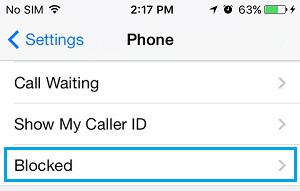 With no caller ID, your iPhone cannot figure out who is calling and won’t be able to block the call. However, your iPhone will indicate that the number is Unknown, the Number is Withheld or that the number has no caller ID. 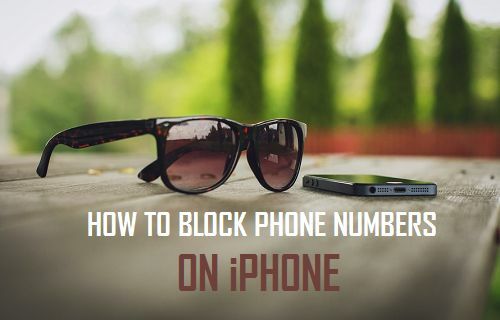 Unfortunately, there is no way so far on an iPhone to block Callers who hide their Caller ID and employ other methods to hide their phone number. 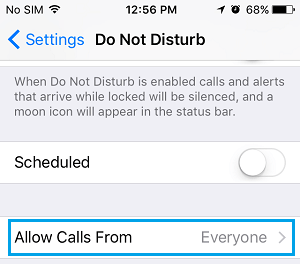 The only way to block Hidden Numbers on iPhone is to customize the Do Not Disturb feature on your iPhone to receive calls only from known callers. 1. From the Home Screen of your iPhone, tap on Settings. 2. 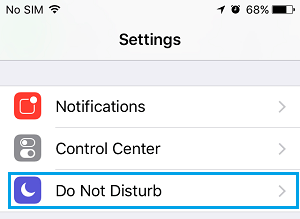 On the Settings screen, scroll down and tap on Do Not Disturb. 3. On the Do Not Disturb Screen, tap on Allow Calls From. 4. On the next screen, tap on All Contacts. 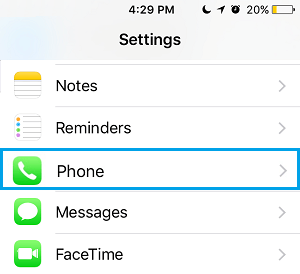 With this setting, your iPhone will only allow calls from people who are on your Contacts List, all other calls from unknown callers who are not listed on your Contacts List will be silenced. One problem with this approach is that you may miss some valid calls in case an important or a genuine caller is not listed on your Contacts List. However, the good thing is that you will still get a missed call notification, and the Callers will be able to leave a voicemail. 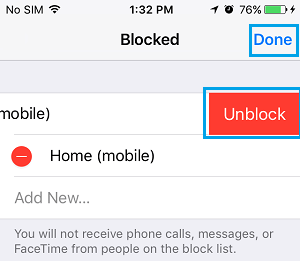 In case you have made a mistake or change your mind, you can easily unblock Phone numbers on your iPhone by following the steps below. 2. On the Settings Screen, scroll down and tap on Phone. 3. Next, tap on Blocked. 4. On the Blocked Screen, you will be able to see the list of all blocked numbers, review this list and tap on Edit. 5. Now, tap on the minus sign (–) Next to the Contact that you want to unblock. 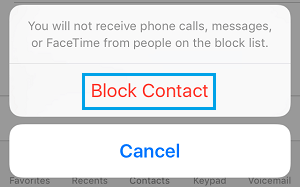 This will reveal a hidden Unblock button, tap on Unblock to remove this Contact from the Call block list on your iPhone.